There are two reasons “Firestorm” is so much better than “Snowfall” — One, The Guardian team rejects interactivity (letting readers control the story) and instead uses advanced web coding to force the reader to experience ALL of the mutimedia, along with the text, as they progress through the story. And secondly, The Guardian team really understands the power of video, blending that video with text in a compelling fashion to ask whether one family’s race to escape a fast-moving fire may portend Australia’s future in the face of climate change. In “Snowfall”, the Times told the story of how three members of a group of veteran off-trail skiers in Washington State’s Cascades died in an avalanche.The project was notable for its extensive use of multimedia, some CSS tricks, and of HTML5, the latest upgrade in Web coding standards. The 17,000-word text was peppered with photo galleries, video clips and links to audio interviews, and each section of the narrative began with a short video loop showing snow falling or clouds moving over a mountain landscape. Several 3-D maps clarified the terrain where the tragedy occurred and a particularly effective bit of animation displayed the avalanche as it occurred, in real time. But The Times project merely glommed those impressive multimedia elements onto the text. There was never any doubt which medium was dominant. You might stop reading to watch a video clip or animation or to scroll through a photo gallery, but then you went back to the text. The dead giveaway was where The Times stuck their mini-documentary, an 11-minute video narrative. The video was compelling, capturing the grandeur of the Cascades, the drama of the avalanche, the sorrow of the survivors. And where did The Times put it? Dead last, at the every end of those 17,000 words. If the video had been at the beginning, where TV-based Web sites such as NBCNews.com would have put it, then who would have read those 17,000 words of text? My point is not to criticize the placement of the video so much as to point out that the Times did two separate versions of the story — one in video and the other in text, with some multimedia elements thrown in. What they did not succeed in doing was to combine those elements into one narrative. The Guardian’s “Firestorm,” on the other hand, melds text and audio and video in a way that fulfills the 15-year-old promise that the Web will usher in a new form of multimedia storytelling. In “Firestorm,” you don’t alternate between text and video. The text is overlayed on the video. A photo filling the entire screen scrolls up and comes to life — a family member explains when they first realized that the flames were a threat, a firefighter tells of the futility of fighting such a gigantic firestorm. And then the video ends and it’s time to scroll down for more text. In “Firestorm,” text doesn’t try to do what video does best — capture the emotions of the trapped family, describe the look of the flames as they top a nearby ridge, or show the devastation of the fire. Photos of the family, as they huddled beneath a pier in the lake below their burning house were featured by the news media across Australia in stories about the fire. In “Firestorm,” that is mentioned, but the text never describes the photos. Instead they are shown, while mom tells how, even as the flames crept closer to the dock where she and her children were huddled, she realized she had her cellphone and asked someone to take some photos. The point is a simple one, but critical — The Guardian staff understands that with video, the images tell their own story. There’s no need to add text. In The Times “Snowfall,” in contrast, reporter John Branch seems to have written his story with no thought of any accompanying media. A female skier, who was caught in the avalanche but thanks to a safety vest survived, explains in a video how she thought she was dying. And sure enough, the text repeats the same quote. Branch writes eloquently of the joys of skiing in thick powder snow, while, a few column inches away, a well-shot video clip does a far more effective job of showing that joy. “Snowfall” was an eye-opener, an intriguing showpiece of what you can do with HTML5, video and 3-D graphics. But if “Snowfall” showed the potential, “Firestorm” is the realization of that potential. The video and photos don’t sidetrack a reader from the print narrative — they are part of the narrative. In “Snowfall,” the text worked as a standalone story, as did the 11-minute video. Drop either element, and the other was just fine. Not so in “Firestorm.” Finally, someone has used coding so the authors can be sure that readers have read and seen all of the multimedia elements as they move through the story instead of tacking photo galleries or video clips or interactive maps on the side, with no assurance that anyone is looking at them. For the past 15 years, those of us in the multimedia storytelling business have promised more than we have delivered. “Rashomon”-like, we’ve told a story from different perspectives — hey, look at my video, here are some photo galleries, maybe an interactive map and, of course, a text story that stood on its own. Each medium provides one look at the story, in ways that TV or print publications can’t do, but ultimately they haven’t really worked together. 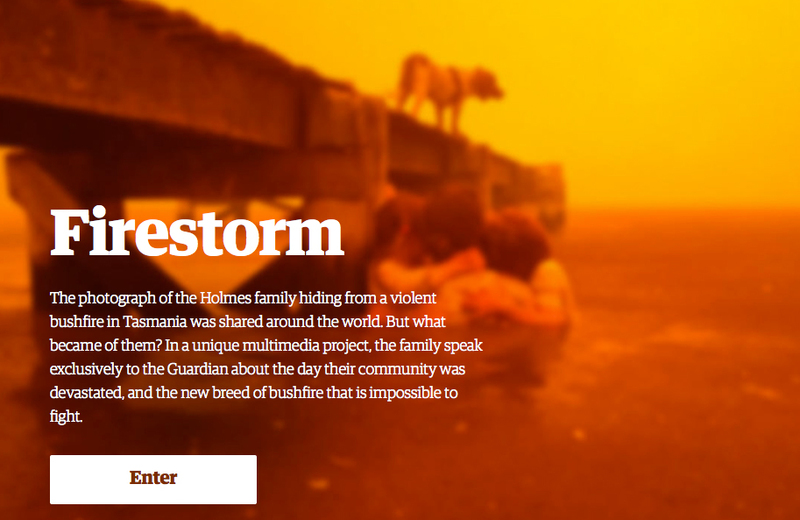 With “Firestorm”, The Guardian shows the way to true multimedia story-telling. Now if someone on their team will just lay out in detail exactly how each element worked, so the rest of us can learn from them.